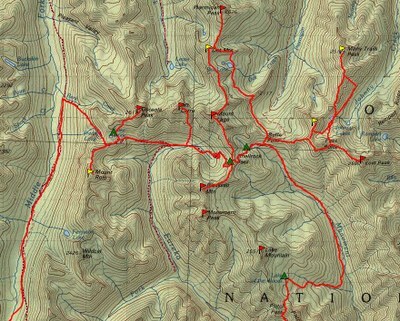 Great clockwise trip with lots of summits in the Paysayten Wilderness. Climbed Rolo, Osceola, Carru, Lago, Dot, Ptarmigan, Blackcap, Lost, Many Trails, and Johnny. Hiked in from Slate Pass, and out the Monument trail. Middle Fork trail recently cut out, great shape, trail to Shellrock Pass from Lake Doris OK, Monument trail a disaster, over 2,000 downed trees, that trail is certainly abandoned! Weather forecast wasn't the best, but since we had the week off, decided to make the best of it, was hoping the Paysayten would be dryer then other areas of the state. We were planning a 6-8 day trip hoping to pick up all the Bulger's and the other top 200 peaks in the area. Planned a loop, starting at Slate Pass and exiting the Monument Trail. Day 1: Left town early, dropped a car at Monument Creek trailhead, then drove up to Slate Pass and started hiking. Middle Fork trail recently cut out, good trail to Lake Doris, set up camp. Great weather day. Day 2: Climbed Rolo with couple of 4th class moved, then climbed Osceola (scramble), broke camp, hiked to gully below Carru, climbed Carru (scramble) then hiked to Shellrock pass and set up camp. Long and tiring day! Nice camping at Shellrock pass, some snowmelt ponds, plugged our water filter, great views. Started showering lightly on climb of Carru, but nothing major. Day 3: Traversed ridge and face NW to Logo, some spots pretty sketchy, didn't want to return that way. On over to Dot, then Ptarmigan. On the way back dropped east below Dot to Dot lakes, really pretty, traversed back around to Butte Pass, only one sketchy point, was east ridge from Lago, found a carn and steep descent that got into basin below Lago, easy scramble back to trail and then back to camp. Day 4: I was tired after a couple of 12 hour days, so needed a short day. Climbed Blackcap, then moved camp to nice area east of Shellrock pass, great camping and good water. Took a spit bath in the lake. Got in tents just in time for 2 hour rain and windstorm. Day 5: Headed out to Lost, then dropped down on east side of Johnny and headed out to Many Trails, very pretty Johnny Lake. Climbed up to saddle and then traversed below west side of ridge, which had some 4th class goat trails, returned on east side, dropped way down and hiked back to Johnny Lakes, then steep scramble up to Johnny Ridge and peak. Back to camp and some well earned rest. Day 6: Day started sprinkling. Hiked Monument Trail south, the trail is abandoned, very discouraging with 2,000 downed trees! Finally made it to Lake of the Woods, great camping. Got a campfire going, dried out and good nights sleep. Day 7: Rain and fog, cold, cloud cover just above the lake, could not see Lake Peak, decided to hike out, no hope of getting Lake and Monument last day. Trail isn't bad from Lake of the Woods, gets confusing on the long ridge down to Eureka creek. Started heavy rain on last 4 miles out to car. Was a great trip, will need another 3 days to go back in for Lake and Monument peaks. There are enough peaks up there that any 5 or 6 day trip should pick up several depending on weather and group desire. Will need some long days to reach Ptarmigan and Lost.